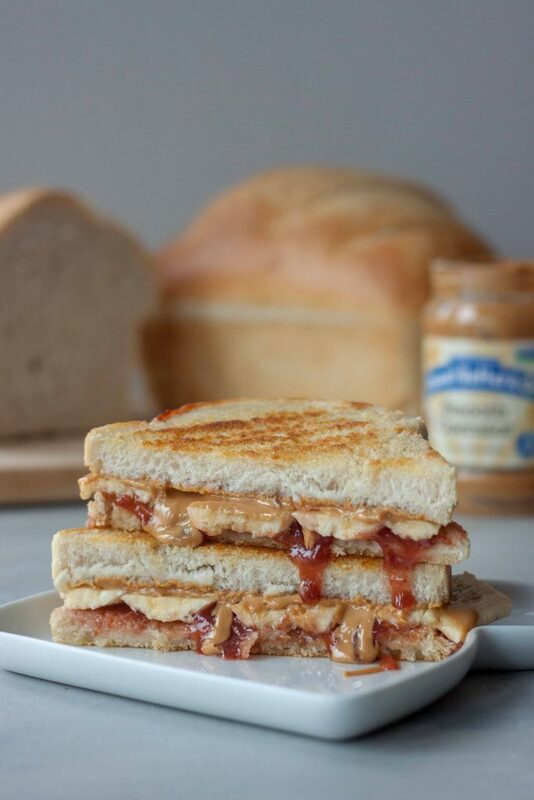 What better day to share one of my favorite PB&J combos with you then National Peanut Butter Day! 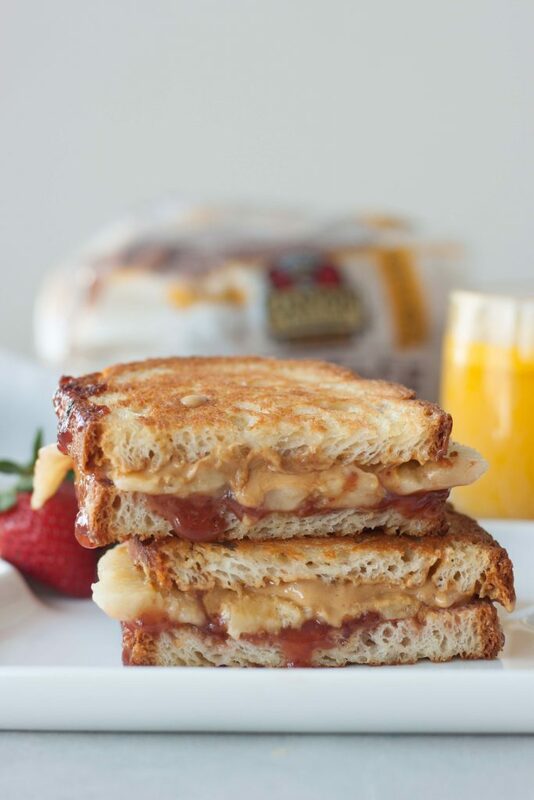 This Grilled Peanut Butter Jam Nana Sandwich is my jam! Do people even still say that? A likes the name and S she just gives me one of those teenage looks. 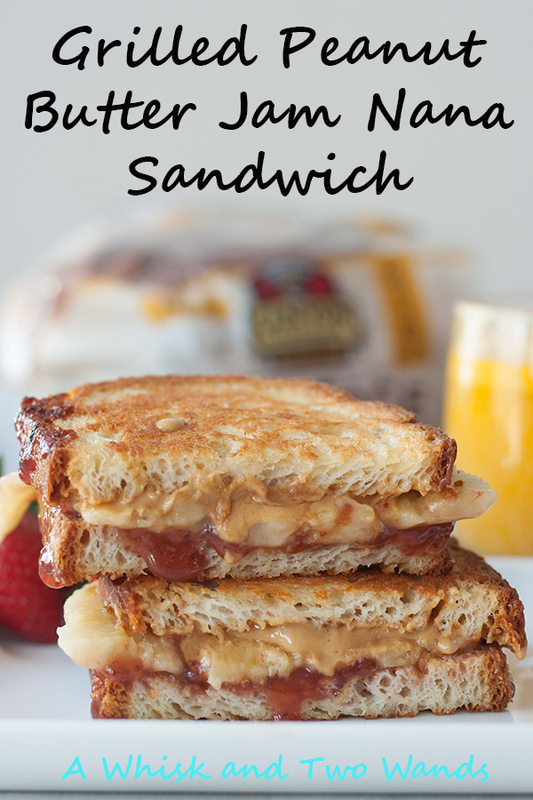 While last summer wasn’t the first time I made this Grilled Peanut Butter Jam Nana Sandwich but it was something magical about it last summer when we made it over the campfire, and then again, and to the point that I was making them for the whole group one night. It didn’t stop there. I wasn’t sure if it was the homemade sourdough that made it so different, the campfire, or the vanilla bean ghee we used. So this called for some testing, and lots of taste testing! First I made it at home on the stove/griddle and yep still good. Then I tried it with coconut oil instead of the vanilla bean ghee and it wasn’t the same but still good. Then I tried it with another bread, Canyon Bakehouse Gluten Free Heritage Bread, using both ghee and coconut oil and yep still delicious. One morning craving it I even made toast, smeared it with peanut butter, swirled it with jam, and then topped it with caramelized bananas and it hit the spot. This combo is a winner no matter how you spread it, make it, or cut it! We won’t even get into how to cut the sandwich, do whatever works for you. 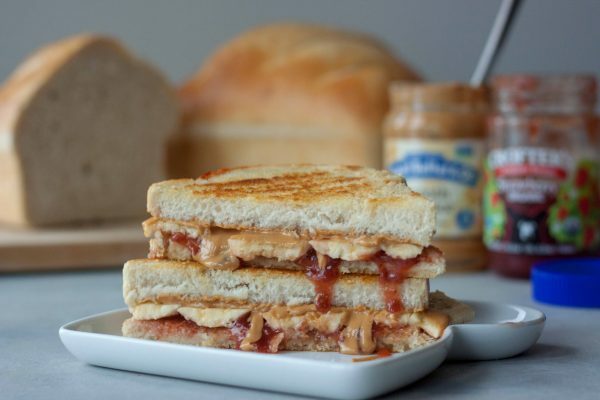 There is just something about a classic pb&j a craving I don’t think I’ll ever out grow. I go in phases where I eat them and then years back about 11 years ago when there wasn’t a single gluten free bread I liked and I didn’t have one for years but still had peanut butter oats or things with fruit or jam like my PB&J Overnight Oats, although back then they weren’t overnight. With the fresh sourdough if the timing is right and it’s nice and fresh it screams to be smeared with peanut butter and jelly. Even my husband makes them regularly. 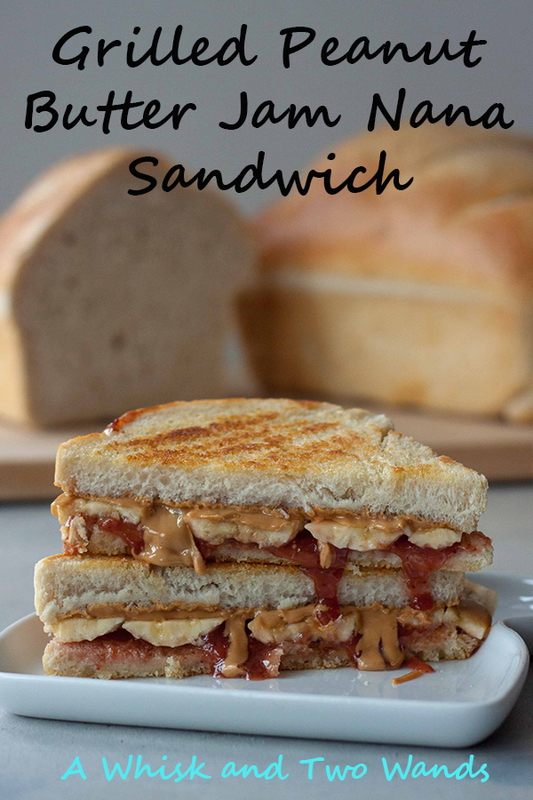 A Grilled Peanut Butter Jam Nana Sandwich is just an upgraded version of the classic, or if this isn’t your jam there is always peanut butter, banana, and honey another classic combo from my childhood. If PB&J isn’t your thing here are some other Peanut Butter recipes to help celebrate National Peanut Butter Day, which should be every day! These are just a few there are more breakfasts, snacks, fun for kids, dinners, and dessert just search the blog based on what you’re craving! If you’re feeling real adventurous you can try one of favorite combos, avocado and peanut butter! Not crazy, just crazy good, trust me! I’ve posted it many times on Instagram, along with this combo. I say don’t knock it until you try it and I haven’t had anyone try it and say they didn’t like it. What’s your favorite way to enjoy peanut butter (crazy question that I probably wouldn’t be able to answer)? 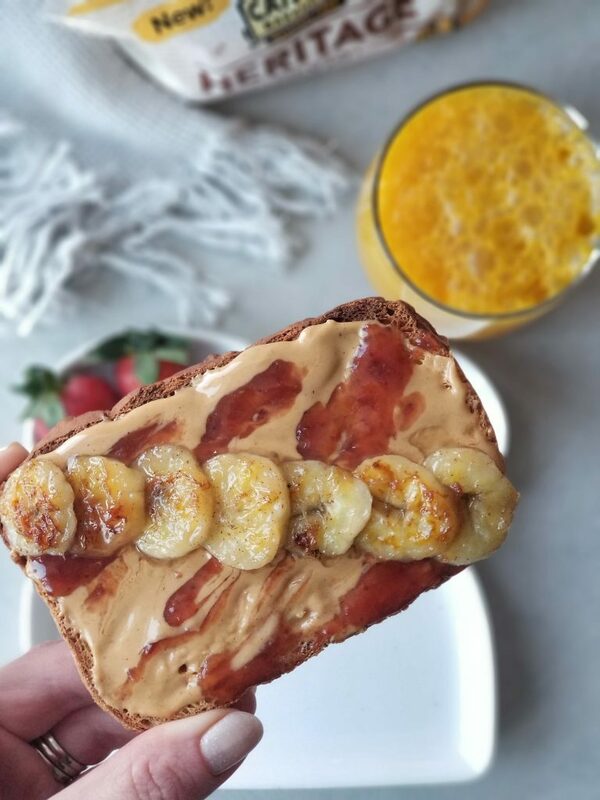 Grilled peanut butter and jelly sandwich with bananas sandwiched in the middle, update on a classic that you never outgrow! Gluten free and vegan friendly. Spread one side of each slice of bread with vanilla bean ghee or coconut oil. Spread peanut butter on the opposite side of one of the slices of bread. Peel banana, only removing one side of the peel so you can hold the banana, slicing lengthwise slice the banana into 3-4 slices. Peel and lay banana slices on top of the peanut butter. Place the slice with peanut butter and banana, buttered side down on the griddle. Spread a thin layer of jam on the other side of the remaining slice of bread. Spread the rest of the jam on top of the bananas. Place the remaining slice of bread jam side down on top of the bananas. Grill until golden brown, just over a minute or so, before flipping and grilling the other side until golden brown. OMG. My mom used to make us grilled PB&J all the time. It’s my comfort food! I love the banana add. Yes it’s like caramelized bananas so different yet the same and comforting! I’m thinking this is about to be my dinner. PB&J is acceptable any time of the day, righT? Yes! Breakfast, lunch, dinner, or even dessert because I was eating these for “dessert” by the campfire last summer! Now this is comfort food! My niece taught me about the grilled pb&j (how did I grow up without this?) and the banana looks like it makes this even better! Yes it is, always hits the spot. That’s kind of funny, did she make you one? I keep forgetting to restock on bananas! :'( I really need to get some so I can make this though–it looks amazing! Funny thing is I was just talking about how I can’t remember the last time I just ate a banana. My husband eats one almost every day, sometimes 2, otherwise I’m not sure we would always have them in the house. All the childhood favorites combined into one sandwich! I love it and so will the kids! It’s a classic combo that you’re never too old to enjoy!